Availability of these services will change from store to store depending on the team members' qualifications. At Health 2000, we are passionate about providing a personalised service that caters to your individual health needs. Below is information about 20 of the main services offered in our stores. 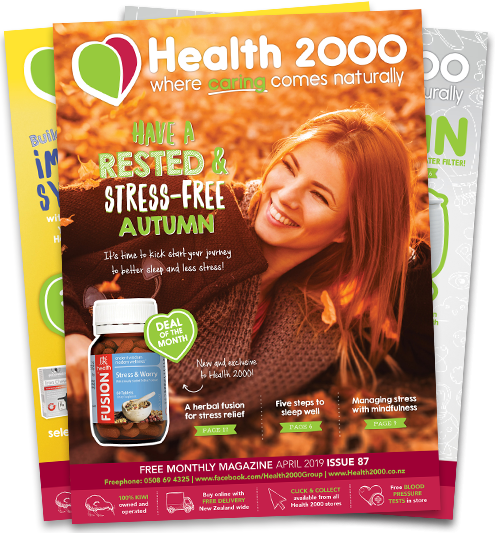 For a list of services offered at your local store, or if you have any further questions, please contact your local Health 2000 store or contact us at www.health2000.co.nz/contact-us. Acupuncture is an aspect of Chinese medicine that focuses on the belief that each organ in your body has its own associated channel or pathway or energy. Acupuncture has been used for thousands of years to address a variety of health concerns, including nausea, back pain, arthritis, and headaches. Using very fine needles, acupuncture aims to bring back your body to a point of balance and harmony. Aromatherapy uses aromatic plant oils for the benefit of physical or mental wellbeing. Different oils have been used for support against a variety of different health concerns such as stress, sleep, congestion and so much more. While Health 2000 stores already carry a diverse range of aromatic oils, an aromatherapist can help to determine which oils or combinations of oils would work best in supporting your health and wellbeing concerns. Blood pressure is a fantastic indicator of your overall health. It is often the case that the higher your blood pressure, the higher your risk of developing health problems in the future. A high blood pressure usually indicates an extra strain on your arteries and heart. Over time, this strain can cause a variety of health issues that can impact your day-to-day health, and in particular, the health of your heart. An in-store blood pressure test allows you to monitor your blood pressure to try to maintain a healthy level. The team in store are also able to offer advice on any questions or concerns that you may have regarding your blood pressure levels and associated health and wellness changes that could support them. A chiropractor focuses on the diagnosis and treatment of neuromuscular disorders, with an emphasis on treatment through manual adjustment of the spine. The aim is usually to reduce pain or support the functionality of your body, as well as to educate about how you can account for your own health via exercise or other therapies to reduce your issues. Chiropractors focus on the intimate relationship between the nervous system and the spine – in particular, the belief that biomechanical and structural derangement of your spine can affect your nervous system. Chiropractors also believe that chiropractic treatment can restore the structural integrity of your spine, reduce pressure on sensitive neurological tissue, and consequently improve your overall health and wellbeing. Colour therapy operates under the philosophy that all things have an optimal vibrational frequency. Colour therapy works to align these vibrations to effect optimised function within your body through the selection and application of specific colours for specific purposes. With their attuned knowledge of the vibrational frequencies of colour, a colour therapist will assess your individual needs (illnesses, viruses, psychological needs etc. ), and apply the appropriate colour (operating on the associated vibrational frequency) to assist in bringing your body back into alignment with your optimised self. Food and environmental sensitivity testing look into which foods or environmental intolerances may be causing irritation and possibly contributing negatively to your health and wellbeing issues. The exact method for testing may differ from store to store. Food and environmental sensitivity testing produces a report that allows you to determine whether certain foods or factors should be avoided or whether they are not likely to be having an impact on your health. When you undergo hair allergy or intolerance testing, a Health 2000 team member will discuss your report and results with you, helping to clarify any questions or concerns. A hair follicle scan helps you to make better nutritional, lifestyle and environmental choices, and it takes just 20 minutes! Hair follicle scanning uses the Cell Wellbeing platform to help you to discover which daily nutritional and environmental factors are impacting your body’s cells. The aim of the scan is to provide you with a guideline to suggest dietary, nutritional and lifestyle changes that could be made to ensure that your body’s cells are functioning at an optimum level. The test produces a 30 page Optimise Wellness Report which offers guidance for the optimisation of your individual cellular needs. These needs may vary from specific nutrients to help with optimised cell function and overall wellbeing, foods that can help you to achieve these needs, interference foods to avoid to help your body find balance and optimal function, the environmental factors which may be interfering or influencing cell function, and much more. When you get a hair follicle scan with Health 2000, a team member will go over this report with you to help to clarify any questions or concerns that you may have, and to help clarify the results. Based on the science of Hematology, Hemaview uses technology to enable you to look into your health via your blood, all in real time. Hemaview is a form of live blood screening that can help you to gain distinctions on ways to improve your health and energy more effectively by assessing your blood. Hemaview observes your live blood cells to assist in identifying a range of health concerns or issues that could be impacting your quality of life. Hemaview takes just two drops of your blood which the assessor will investigate under a microscope. Their investigation looks into the size, shape and ratios of your red and white blood cells to provide more information about what is going on inside your body. Herbalists use botanical substances like herbs, roots, bark, and essences to improve health, promote healing, and for many other medicinal purposes. Plants have been the basis for medicinal treatments through much of human history, and the medical value of plants is still widely believed and practiced widely today. A certified herbalist specialises in utilising the healing properties of plants for various health concerns. An herbalist uses specific parts or combinations of certain plants to improve the overall health and wellbeing of their patients. Homoeopathy is a system of natural health care that has been used for hundreds of years. It works by supporting and stimulating your personal healing ability and is based on the belief that your body can cure itself. A homoeopath will select the most appropriate medicine based on your specific symptoms, concerns and overall level of health. Kinesiology studies the mechanics of body movements. It uses muscle testing to identify imbalances in your body’s structural, chemical and emotional energy. Kinesiologists look for ways to improve the overall efficiency and performance of your body by looking at the factors that may influence your overall movement and wellbeing. However, unlike many other therapeutic techniques, kinesiology doesn’t just look to improve the way that your body functions physically. It looks at your health and wellbeing in a holistic manner and uses muscles as monitors of stress and imbalance in your body. Due to the complex nature of kinesiology, we encourage you to speak with the team at your local store to gain further information on whether it may be the right form of treatment for you. Magnesium is the most abundant element by mass in the human body. It is essential to all cells and is involved in over 300 enzymatic interactions. Adequate levels of magnesium are therefore highly important for your overall health and wellbeing. Take our magnesium test to determine whether your body is lacking magnesium. Massage has been used for thousands of years to help with muscle tension and uncomfortable joints, and to help your body to relax and recover from a variety life stressors, factors and events. Massage involves the application of specific techniques aimed to treat different factors or concerns as determined by each participating individual. Our stores offer a variety of different kinds of massage that each address different concerns. For further information on what kinds of massage may be offered by your local store, please contact the store directly. Take a holistic approach to nutrient deficiencies, weight management, gut health, food allergies and toxins with a naturopath consultation. Naturopathy is a system of alternative medicine that emphasises the use of natural agents to maintain and support your mental and physical health. A naturopathic consultation gives you the opportunity to discuss your health concerns and goals with a professional who is best suited to investigate your personal situation and provide expert, practical advice to address your concerns and goals. Your nutrition plays a big role in your overall health and wellbeing. Nutrition is important in all living things and is relative to the supply of nutrients required by your body to stay alive. It is an important part of leading a healthy lifestyle. Different foods contain a different profile of nutrients required for your body to operate, grow, and repair. Our nutritionists can work with you to discover which foods are better suited to your body type, correct portion sizes, and a meal plan to help you achieve your healthy eating or fitness goals. Osteopathy is a manual therapy that aims to improve your overall body health and wellbeing by manipulating and strengthening your musculoskeletal framework through manual readjustments. Osteopathy recognises the important link between the structure of your body and the way that it functions. Using skilled evaluation, diagnosis, and a variety of hands-on techniques, osteopaths can identify important disturbances affecting your body, which they can then begin to treat. Osteopaths take a holistic approach to treatment and will look at the way that your body functions as a whole, and as such will often evaluate other areas of your body along with the area that is troubling you. Common treatment methods aim to avoid any form of discomfort as much as possible and include massage, stretching, repetitive movements, joint mobilisation and manipulation. Most biochemical reactions essential to not only your health and wellbeing, but to your life in general, take place in a fluid environment within your body. Your body is designed to maintain a very delicate pH balance in its fluids, tissues and systems; therefore, pH levels can be a fantastic indicator of the health of your body. The test for pH levels is simple and pain free. Results provide a good indication as to the current pH levels of your body and allow the team members at Health 2000 to provide you with expert advice to address your natural health concerns. Note: for an accurate pH reading, we recommend doing this test two or more hours after consuming food or beverages (with the exception of water). Physiotherapy uses proven techniques to help you to achieve restored movement and function when affected by injury, disability or a health condition. Physiotherapists have an in-depth knowledge of how your body works, which they use to assess, diagnose and treat your symptoms. They have the skills to treat and prevent a range of health problems involving your joints, bones, soft tissues, heart, chest, lungs, brain and nervous system. Reiki is a Japanese technique for stress reduction and relaxation that is believed to also promote healing. Reiki is based on the idea that an unseen life force energy flows through all of us and is what causes us to be alive. Reiki believes that if your life force energy is low or stagnant, then you are more likely to feel unwell or under stress, while if it is high and flowing then you are more likely to be happy and healthy. Reiki healing treats you as a whole person, including your body, emotions, mind and spirit, with the aim of creating relaxed feeling of peace, security and wellbeing. Zinc is a mineral that is present in every tissue, organ and fluid in your body. Zinc is a vital nutrient for healthy immune function, energy and metabolic regulation, and is also key to male reproductive health. Your body does not store excess zinc, so it must be consumed regularly as a part of your diet. Many of our stores offer a quick, easy and pain-free way to check your zinc levels to see whether your zinc is at an optimum level. Once you have taken the test, our team members can offer advice and suggestions to increase or maintain your zinc intake based on these results.